Jesus. How could I not include Him? As God, He didn't have to come to live on earth at all. But He chose to come here, suffer, and die a humiliating death ... for me and for you. He knew that, apart from Him, I have no chance of paying the debt for my sin. David. He sinned, even had some major failures, yet God called him "a man after my own heart." How sweet it would be if God regarded me as a woman after His own heart! Paul. I appreciate Paul for a number of reasons. First, his conversion demonstrates just how completely we can be transformed by Christ. Second, he's very honest. For example, he wrote this to the Romans: "I don't really understand myself, for I want to do what is right, but I don't do it. Instead, I do what I hate." (Romans 7:15, NLT). I can certainly relate to that! Third, his epistles are just packed with wisdom. Abigail. She showed how grace and humility can soothe anger and make peace. Peter. Another imperfect person, yet Jesus uses him in mighty ways. He left his life as a fisherman to follow Christ. On several occasions he defended Jesus, even to the point of cutting off someone's ear. Just before the crucifixion, of course, he denied knowing Jesus. Even then, Jesus gave him another chance, and Peter didn't waste it. He helped start the early church, he performed miracles in the name of Christ, and he gave eloquent speeches that changed many lives. I appreciate the people whose example reminds me that it's okay to be imperfect. God can still use me. I like Abigail because she was bold as well as gracious. And Jesus ... what can I say? He gave everything so that I might have life. As if that wasn't enough, He walks with me through this life, so I'm never facing challenges alone. Do you have favorite people from the Bible? 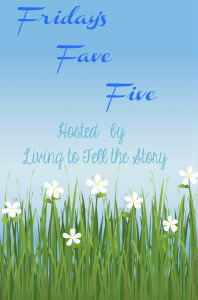 For more Friday's Fave Five, visit Susanne at Living to Tell the Story. Oh i love how you did your FFF this week! great idea!! My fave people from the Bible are: Moses, David, Elisabeth, John, Joshua, and Ruth. And of course my Savior and Redeemer...JESUS!! the lover of my soul. I hope you have a blessed Easter/Resurrection Day!! Isn't it wonderful knowing we are not alone? Love this post! Reading of the life of David (and Peter) always is an encouragement knowing that they made major errors even though they loved God. It makes me realize that there is hope for me and that I serve the same loving and forgiving God as he did. Very inspiring to be reminded of those in the Word whose shortcomings only drew them closer to the Lord and their need for Him. My favorite person besides Jesus, of course, is Esther. I love her story of risking her life for what was right.